Delta Corporation Limited manufacturers and markets international and locally-produced beverages in Zimbabwe. It operates in four segments: non-alcoholic beverages, sparkling beverages, lager beers and traditional beers. Brands in its non-alcoholic range are a flavoured maize drink called Shumba Maheu, and a flavoured drinking yoghurt called Supersip Yogurt. The sparkling beverages division operates two bottling plants and one canning plant; bottling and distributing popular cool drink brands sold worldwide by the Coca-Cola Company, a range of drink mixes and an energy drink called Burn. The lager beer division operates two breweries; bottling and distributing international brands such as Castle Lite, Miller’s, Peroni, Redds, Brutal Fruit and Sarita. Delta Corporation Limited has a monopoly in the traditional beer market in Zimbabwe with 14 breweries located across the country; brewing and distributing a well-known sorghum beer brand called Chibuku. Other subsidiaries have interests in transport and logistics, barley and sorghum malting, food processing, packaging, retailing wines and spirits, recycling, tin can production and leadership training. 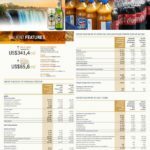 Delta Corporation Limited manufacturers and markets international and locally-produced beverages in Zimbabwe. It operates in four segments: non-alcoholic beverages, sparkling beverages, lager beers and traditional beers. Brands in its non-alcoholic… READ MORE. Delta Corporation Limited Listed on the Zimbabwe Stock Exchange Declares Final Dividend of 2.5 US cents payable on 6 November 2018.